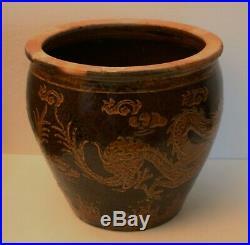 This entry is filed under vintage and tagged bowl, chinese, craft, dragon, fish, jardiniere, large, planter, pottery, vase, vintage. 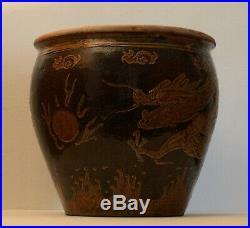 VINTAGE EXTRA LARGE AND HEAVY CHINESE “DRAGONS CHASING THE FLAMING PEARL” TERRACOTTA POTTERY FISH BOWL – JARDINIERE PLANTER. 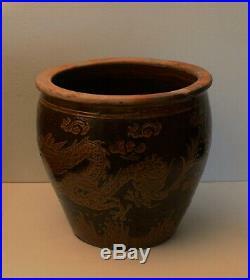 This EXTRA LARGE Chinese fish bowl jardiniere planter measures 16″ high, 17″ round at the rim and 11 round at the bottom. It has a 3/4 thick clay body and weighs a whopping 40 lbs! It features two dragons “chasing the flaming pearl” with a choppy-stormlike ocean at the bottom and small cloud formations at the top. The four-clawed dragons are highly STYLIZED and influenced by Chinese dragon paintings. 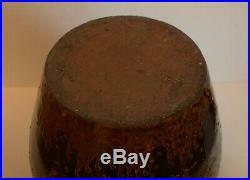 The images are quite a joy to see “in the round” similar to sculpture (see successive photos). 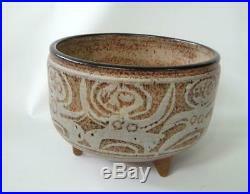 The glaze colors are mottled dark brown with a mottled carmel color for the images created in slight relief. 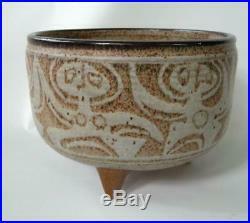 The interior is glazed mottled dark brown and the top rim is unglazed. 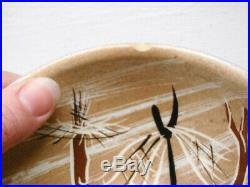 The top rim has a Chinese character stamp along with a few Roman numeral stamps (see photos with zoom tool). 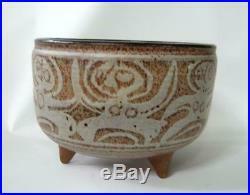 It can be used as a koi fish-lily pond bowl, a flower/tree planter or as a table base. I estimate this vintage extra large and heavy terracotta pottery fish bowl – jardiniere planter to be from the 1950′s-60′s. 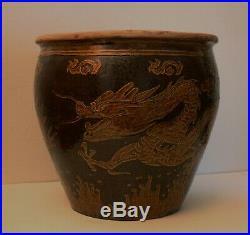 This RARE extra large fish bowl jardinière planter in good condition for being about 50-60 years old. 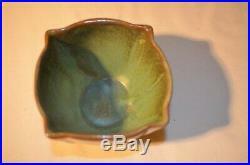 It has a few bottom and top edge glaze nicks/inclusions. 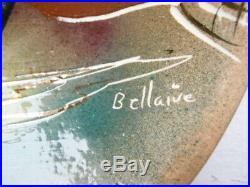 The unglazed rim has color variations with some enamel overspray from the firing process. Please see photos for condition. Please excuse the glare spots in the photos… This piece is fine and without blemish. 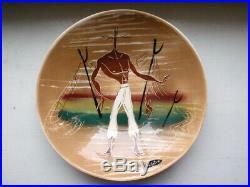 What a great addition to your East Asian or Arts & Crafts decor! The extra large 45 lbs. About mod-designs4u Welcome modern design enthusiasts! Mod-designs4u specializes in items from the 1920s-70s which include Art Deco, Modern Streamline, Machine Age, Mid-Century Modern, Scandinavian Modern, Danish Modern, Italian Modern, Biomorphic, Freeform, Space Age and Post-Modern designs. 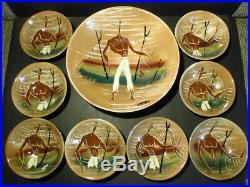 Our entire inventory consists of high quality items made in the U. Mod-designs4u has a revolving inventory of scarce vintage items which includes furnishings, lamps (and lamp parts), paintings, drawings, serigraphs, woodblocks, lithographs, etchings, engravings, photography, posters, sculpture, art pottery, art glass, art metal, dinnerware, kitchenware, barware, design accessories, antiquarian and art/design books, ephemera and collectibles. We at mod-designs4u have an extensive background and formal education in modern design and fine art. All items are personally vetted to meet the aforementioned design and qualitative criteria. We are a great source for collectors, historians, artists, set decorators, interior designers and architects. Thank you for supporting American small businesses! We have been at risk for quite some time as Main Streets have succumbed to mega-stores. 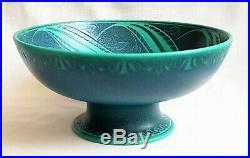 Mod-designs4u offers scarce and vintage items at fair prices because we want your business! 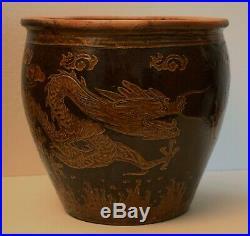 The item “Vintage LARGE Chinese Pottery DRAGON Fish Bowl Jardiniere Planter Vase Art Craft” is in sale since Monday, March 18, 2019. 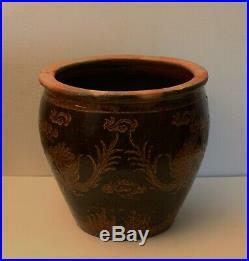 This item is in the category “Antiques\Decorative Arts\Ceramics & Porcelain\Planters”. 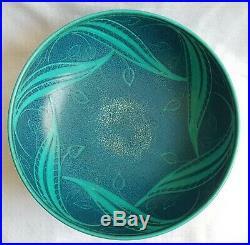 The seller is “mod-designs4u” and is located in Boulder City, Nevada. This item can be shipped to United States. 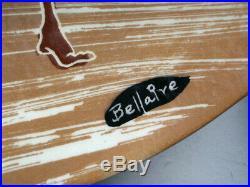 This entry is filed under marc and tagged 1950s, beachcomber, bellaire, bowl, gold, marc, platter, pottery, serve, tiki. 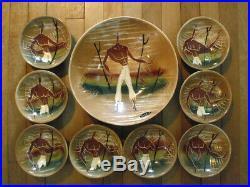 MARC BELLAIRE Pottery 1950′s BEACHCOMBER TIKI LARGE PLATTER SERVING BOWL SET LOT CA Gold. This set of 8 salad bowls with 1 large serving bowl are from an upstate NY estate and will fit in nicely with your collection! 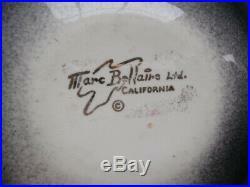 Maker – Marc Bellaire LTD, California. 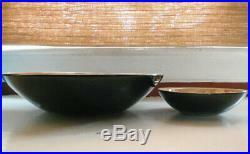 Size – Serving Bowl is approx 12.5″ across x 3″ deep and 3 lbs, Salad Bowls are approx 6.5 across and 12-13 oz each. Color – Neutrals with gold accenting, black underside with white center, gold maker’s mark. 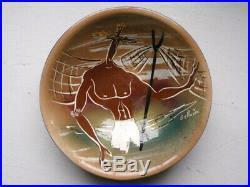 Beach scene artist sand signed sea collector man island South Pacific shore Bahamas estate find boardwalk rustic modern art. If you have any questions, just ask! 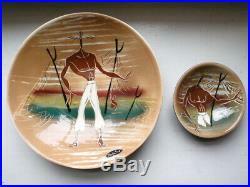 The item “Vtg MARC BELLAIRE Pottery 1950s BEACHCOMBER TIKI PLATTER SERVE BOWL SET LOT Gold” is in sale since Monday, April 15, 2019. 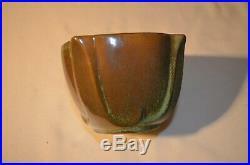 This item is in the category “Pottery & Glass\Pottery & China\Art Pottery\California Pottery”. 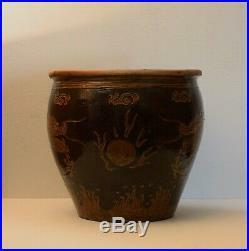 The seller is “luckbealady44″ and is located in Ravena, New York. This item can be shipped to United States. 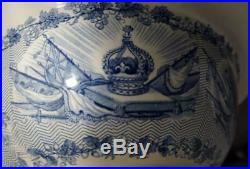 This entry is filed under queen and tagged blue, bowl, coronation, pearlware, pottery, queen, victoria, wash, white. 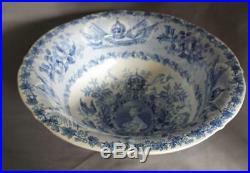 Wash Basin Queen Victoria Coronation Blue and White Pearlware Pottery. 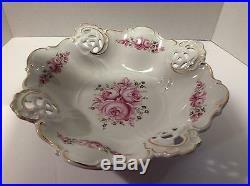 “Queen Victoria Pearlware Bowl”. 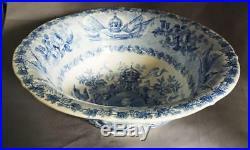 Description : This is a very rare, elaborate huge, blue and white transfer printed Staffordshire Pearlware wash basin, made to Comemmorate the Coronation of Queen Victoria in 1838. 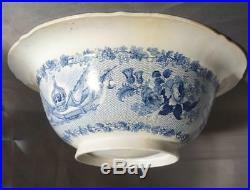 Place of Origin : England Maker : Staffordshire Materials : Earthenware Marks : None Age : It dates from 1838 Measurements : Approx. 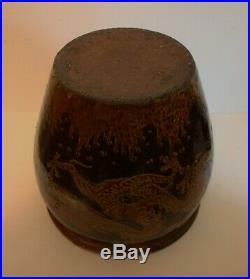 13 cm high and 35 cm diameter. 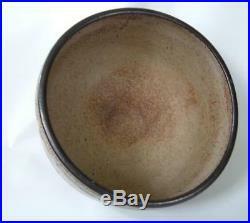 Discolouration to inside of bowl suggesting possible restoration. 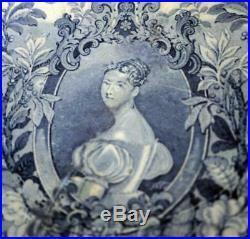 This is a pre used vintage or antique item and I list all the faults I can find in the condition report, but please look at the enlargeable photos to further appraise condition, as these form part of the description. 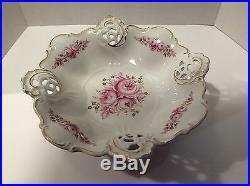 Where I have lots of antique and collectable items for sale and Add me to your Favorite Sellers. Cheques and Postal Orders accepted from UK Buyers only. Most items will be sent by a secure signed for Postal service. Postal service and cost are shown on the listing. I post all items and do not offer a collection service. Please read my feedback. Please do not hesitate to contact me if you require any further information or photos. Auctiva offers Free Image Hosting and Editing. Auctiva gets you noticed! Track Page Views With. Auctiva’s FREE Counter. 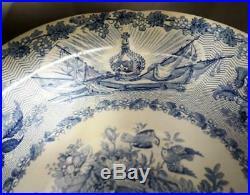 The item “Queen Victoria Coronation Blue and White Pearlware Pottery Wash Bowl” is in sale since Thursday, October 18, 2018. 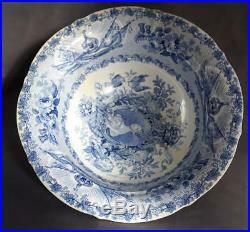 This item is in the category “Collectables\Royalty Collectables\Victoria (1837-1901)”. 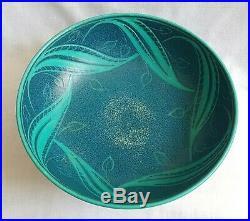 The seller is “topsystrove” and is located in NE England. This item can be shipped worldwide. 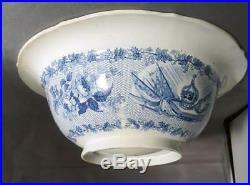 This entry is filed under vintage and tagged bowl, dutch, footed, gouda, pottery, tazza, vintage, zuid-holland. 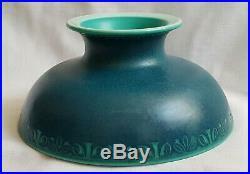 VINTAGE GOUDA ZUID-HOLLAND DUTCH ART POTTERY TAZZA FOOTED BOWL. 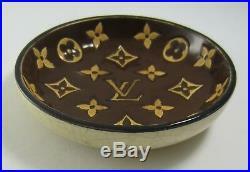 Up for sale is a vintage Gouda art pottery two handled tazza or footed bowl hand painted in desire royal pattern. Marked on the bottom. Please see photos below for more details. 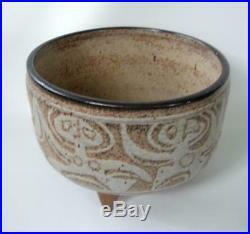 Measurements: The bowl measures approximately 7.8 cm high and 18.7 cm wide from handle to handle. 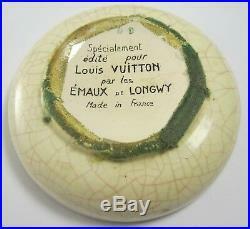 Condition: It is in very good vintage condition with normal wear commensurate with age and use. 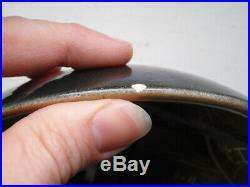 No visible chips, cracks or repairs. Please inquire for more information. There is nothing we can do about it. 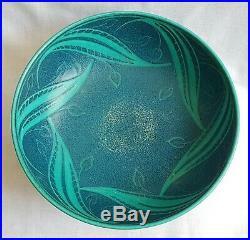 Check out my other listings. However, we are by no means experts and this information is based solely on our general knowledge & opinions. We will disclose any damage or defect that is not consistent with what should be expected with normal wear, and will always disclose any chips, breaks, repairs, etc. That we believe affect the usability and value of the piece over and above normal wear for the age of the item. Please check pictures and read our description carefully!! We will be glad to answer all your questions and to provide additional photos and information. All damaged or missing items will investigated by the Canada Post. 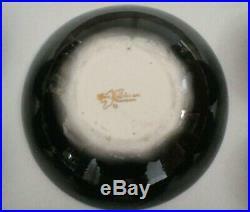 Customer is responsible to report any damage within five days receiving the item. All packing material should be kept in case a claim is needed. These charges are the buyers responsibility. Please contact me first and wait for approval before returning the item. If a package is lost or damaged, it can take up to 1 month to investigate these claims. If proper instructions are not followed your return will be invalid and you will forfeit all privileges. Feedback If you are not completely happy with with our products or service, please give us the opportunity to make amends and ensure your complete satisfaction. 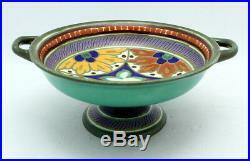 The item “VINTAGE GOUDA ZUID-HOLLAND DUTCH ART POTTERY TAZZA FOOTED BOWL” is in sale since Friday, June 22, 2018. 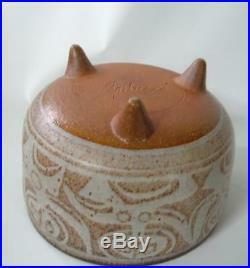 This item is in the category “Pottery & Glass\Pottery & China\Art Pottery\Gouda”. 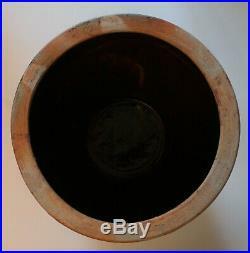 The seller is “pwjc88″ and is located in Vancouver, British Columbia. 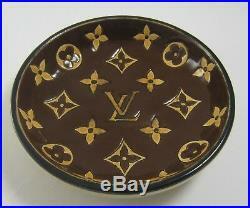 This item can be shipped to Canada, all countries in Europe, United States, Australia. 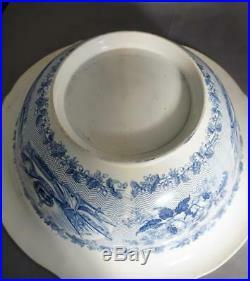 This entry is filed under vintage and tagged bowl, deco, footed, lancastrian, mycock, pilkingtons, royal, vintage. 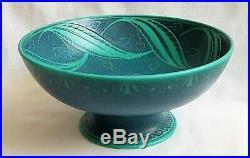 A Art Deco Pilkingtons Royal Lancastrian footed Bowl, designed by W S Mycock. 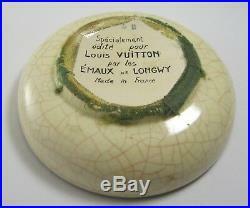 It is fully marked on it base, with its shape number 3174 – Pilkingtons mark – Royal Lancastrian – Made in England. 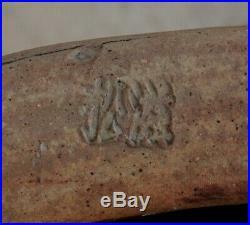 It also has the monogram mark of – W S Mycock. 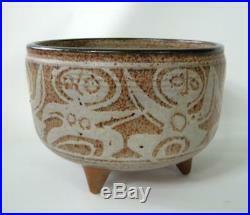 It measures 10″ or 25.5 cm wide x 4 3/4″ or 12 cm high and is in very good condition, with no damage. 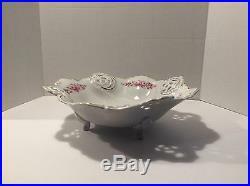 The item “VINTAGE ART DECO PILKINGTONS ROYAL LANCASTRIAN FOOTED BOWL W S MYCOCK 3174 VGC” is in sale since Wednesday, April 3, 2019. 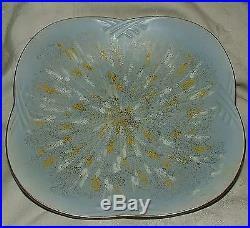 This item is in the category “Pottery, Porcelain & Glass\Pottery\Art Pottery\British”. 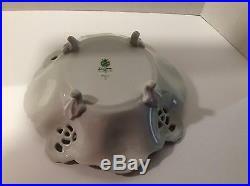 The seller is “pmjc2000″ and is located in Portsmouth. This item can be shipped worldwide. This entry is filed under frankoma and tagged bowl, frankoma, green, mark, perfect, prairie, square, vintage. 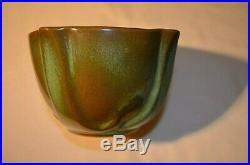 Frankoma Prairie Green Square Bowl #30 with “Cat Mark”: Vintage Perfect! This has always been one of our Favorite Items in our Collection. Circa 1936-38 (Phylis and Tom Bess). 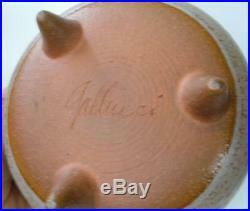 Beautiful and clean Ada Clay with a perfect “Cat Mark”. This piece just could not be any better! We’ve had it a long, long time on the old Pump Organ and based upon John Frank’s original concept idea of the “Rounded Square”, this is a perfect example. Perfectly proportioned with lots of Green/Gold, which is what attracted us to this piece in the beginning. You’ll love this piece! Final Note: This is the “Original Complete Cat” Mark, not the first, not the “Broken”. All 3 were lead and melted in the Fire! From our many years spending time in Arizona the Jaguar was a frequent visitor. Likewise, in the Old Days to Oklahoma. From the size of the head and the musculature, this “Puma” really appears to be the Jaguar, a frequent visitor from Mexico due South and probably resident. I’ve seen Jaguars. I have Mountain Lions here on the Farm and Ranch in North Dakota. Lions are leaner and slighter and the Jaguar is actually larger. I’ll wager that this “Puma” (a generic name for “Cat” back then) was modeled on the Jaguar, but then I’m an English Prof, not a Biologist! 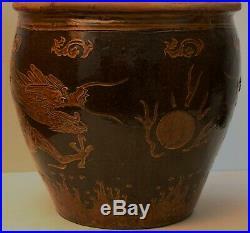 Also, this is the most complete mark I’ve seen of the Pottery Pot behind the Cat and the Moon. And that “halo” over the moon is actually the TOP OF THE POT AND RIM! The full rounded left side is shown here and also the base. 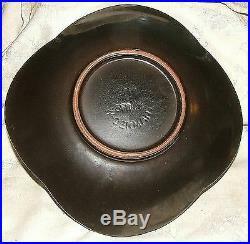 After the Fire, this lead stamp melted and was remade without the Pot, hence they knocked off the bottom of the Pot and also the rounded sides. This new creation became the “Cat” most people know! You’ll see that I’m right about the Pot, and the Jaguar versus Mountain Lion? Well, I’m an English Professor, not a Biologist. Let’s just call it a “Cat Mark”! 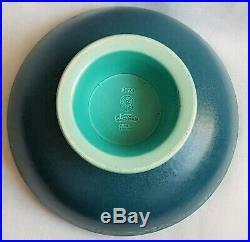 The item “Frankoma Prairie Green Square Bowl #30 with Cat Mark Vintage Perfect” is in sale since Wednesday, April 3, 2019. 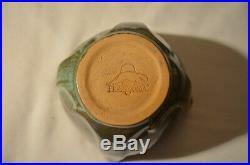 This item is in the category “Pottery & Glass\Pottery & China\Art Pottery\Frankoma, Gracetone”. The seller is “home-on-the-range” and is located in Minot, North Dakota. This item can be shipped to United States.